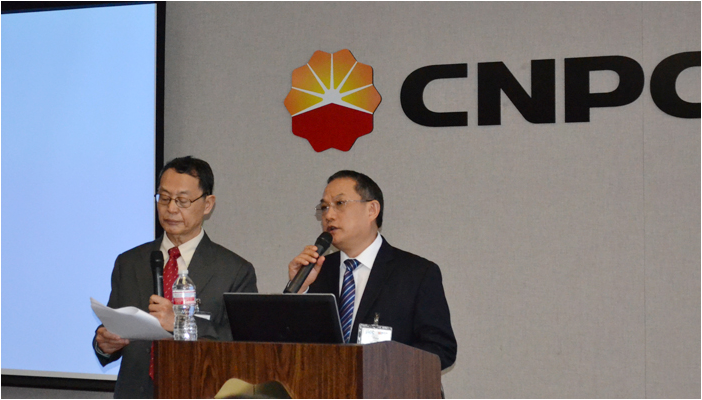 International Association of Geophysical Contractors (IAGC) and International Association of Oil & Gas Producers (IOGP) held their semi-annual Joint HSSE Forum on April 19th/ 20th of 2016 at CNPC Building, Houston, Texas USA. The Forum was hosted by BGP, and organized and presented by IAGC and IOGP. The following opening remarks at the forum were made by Mr. Gou Liang, President of BGP. The 2016 IAGC/IOGP Spring HSSE Forum is launched today in this beautiful spring. On behalf of BGP, I would like to extend my warm welcome and heartfelt greetings to all the guests present today. It is my great pleasure and honor to come from China to host this HSSE Forum in Houston. This is my first time as I have not had this wonderful opportunity before. It would have been such a great experience for all of you to come to Beijing for this conference, since I’m sure you would all agree that spring time is the best time to visit the city. Some of you may recall that BGP hosted such a meeting in Beijing back in 2010. I am extremely happy to see everyone here and that all the seats are filled! There is a Chinese saying that says that this is “an auspicious sign for success”. I think that we are all in agreement that it is helpful for oil companies and contractors to meet regularly so that we can work together closely in order to wade through this very difficult time caused by very low oil prices. With that said, I would like to share some thoughts and suggestions for us to share and discuss. First of all, I suggest a new management approach ---“0” Risk. “0” incidents has been the goal of many companies. It is a strenuous task for the company as it requires deeply-felt leadership from the executive/senior management down to all levels of management as well as the alignment of workers. A step change in HSSE management could be the “0” risk goal approach which requires an even deeper commitment by the management and embracement by all workers. The ultimate goal is to create a “risk-averse culture” such that any worker does not tolerate even an iota of risk. Secondly, I suggest oil companies consider and adopt practical and simplified contract requirements---to reduce cost and maximize productivity. As you know, rigid contract requirements of some oil companies which should have considered the lack of local resources and conditions in some cases have invariably put contractors in a very onerous position. I suggest that contract requirements be more practical and reasonable for the conditions of the work area and/or country so that a contractor can implement them without compromising the basic requirements of the client or local and national laws and regulations. I also believe contract requirements should be much simplified and clearer than what we have been dealing with. They should also allow for “exceptions” if warranted by the conditions of the work area and local communities. Thirdly, I encourage working together as a “team”---Oil companies & Contractors---to reduce cost and maximize productivity. I am speaking on behalf of BGP now. The “teamwork” approach has been working well for some BGP crews. We all know that active collaboration with a client on a project is the key to a safe, efficient and successful operation. I suggest a three-layered approach to make “teamwork” successful. 1. Client reps should treat themselves as part of Crew Management and not just as a “watchman” or “supervisor” for the client company. 2. Client reps should work closely with Crew Management to help manage the operation, offering advice and facilitating a safe, efficient and successful operation. 3. Client reps should respect that fact that the contractor is the one ultimately responsible for the execution and completion of the project. 2) Reduces total investment by the client. 3) Shortens project completion time. 4) Reduces manpower working in the field. 5) Minimizes risk in operation. Hopefully, the above four thoughts and suggestions will prompt the IAGC/IOGP members to generate even better ideas and practices which not only enable us to get through this depressed period but also create an even brighter future! Here’s to an enjoyable and fruitful two days for everyone! Thank you!